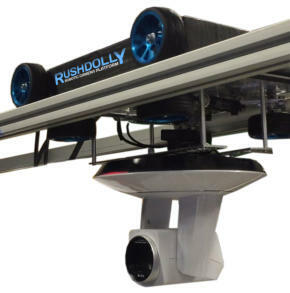 RUSHDOLLY is tiny but mighty. It runs on aluminum channel track on the floor or suspended. Go from a slow creep to walking speed with “studio quiet” operation. 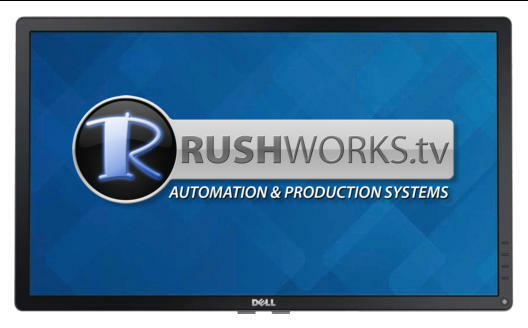 It’s the newest entry in our expanding catalog of robotic interfaces and devices designed to enhance the quality of video production by a single operator. The unit is 10” x 13” x 5” and weighs just 8 pounds. It uses a high RPM motor with gear reduction to create a lot of torque, making the unit capable of managing a considerable payload from slow to high speeds. All the critical connections are on the end of the dolly, and cable management is handled elegantly and efficiently to minimize friction and drag. 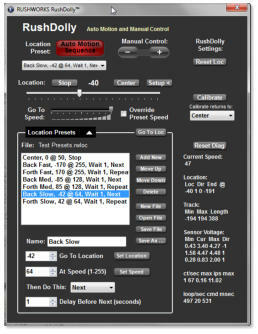 It uses timing tape on the guide channels to insure a high degree of repeatable accuracy when going to presets. The camera platform can be mounted on the top or bottom of the dolly to support both floor and suspended operations.